A Scottish Isles Driving Tour – Take the road to the isles along Scotland’s stunning West Coast to explore the beautiful inner Hebridean islands of Skye and Mull. On these secluded Scottish islands, you’ll enjoy spectacular natural beauty – pass dramatic mountain ranges, see sparkling lochs and experience an abundance of wildlife on land and in the coastal waters. Skye and Mull are also peppered with unique archaeological features and intriguing historic sites just waiting to be explored. Arriving in to Glasgow Airport (can also start at Edinburgh Airport), collect your vehicle and head North for the Highlands. Enjoy your first flavour of Scotland’s raw natural beauty, as you pass along the "Bonny Banks" of Loch Lomond and through the Trossachs National Park. Pass through the historic town of Inveraray, perhaps stopping to view the castle which was used in the filming of Downton Abbey season IV. 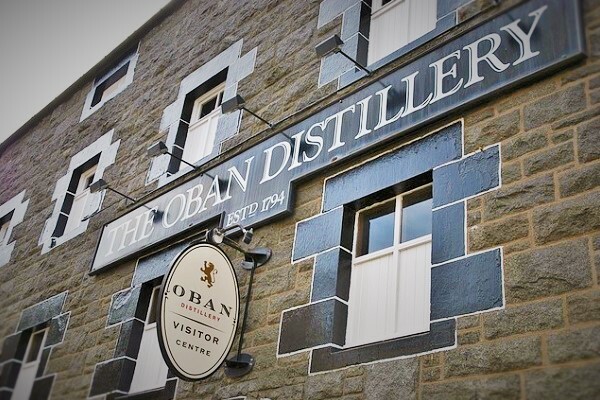 Then onwards to the remote west coast of Scotland to Oban "Gateway to the Isles", where you can explore the pretty harbour town including hill-top folly of Mccaigs tower and the famous Oban Whiskey Distillery. Today your island adventure begins as you take the ferry from Oban to the romantic Isle of Mull. Here you can tour the wild and awe-inspiring landscapes, moorland and sweeping coastline of this remote island. Spend today exploring the North of the island; visit the contrasting castles around Duart Bay – Duart Castle is a 13th century ruin whilst nearby Torosay Castle is an elegant Baronial Manor house. 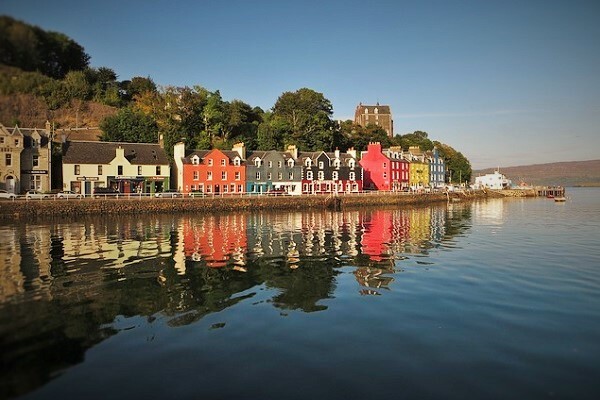 The onwards to the town of Tobermory a bustling natural port and fishing town famed for its quaint rows of pastel coloured cottages. Dedicate today to exploring the South of the Isle of Mull. Visit the imposing fortified tower at Moy Castle set against a dramatic mountain back-drop and wander the adjacent Lochbuie Stone circle. Then head for the most southerly tip of the island at Fionnphort where you can cross by foot passenger ferry to the tiny and peaceful Isle of Iona and the spiritual retreat of Iona Abbe. Time-permitting enjoy a boat trip from the west of the island to Staffa and the Treshnish Islands to see Fingal’s Cave and an abundance of sea-life such as whales, porpoise and nesting puffins. Depart the Isle of Mull by ferry from Fishnish to Lochaline on the mainland before taking the country roads north. 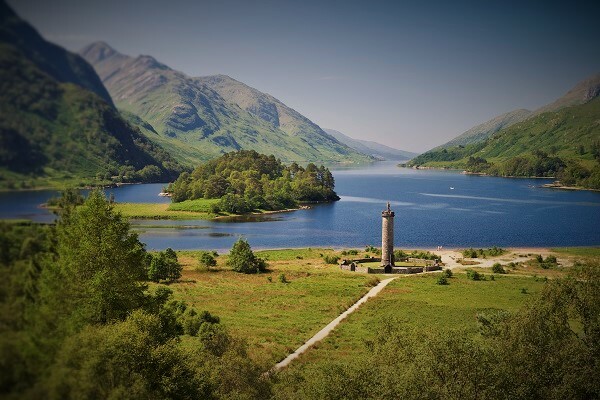 Take the "Road to the Isles" to visit the Glenfinnan Monument dedicated to Bonnie Prince Charlie and the magnificent Glenfinnan viaduct, made famous in the Harry Potter movies and the Hogwarts Express. Then onwards to the fishing town of Mallaig to catch the ferry to the Isle of Skye. You may choose to stop at Armadale Castle in the South of the island before passing the beautiful peaks of the Cuillin Hills on route to the island main town at Portree and its bustling harbour. 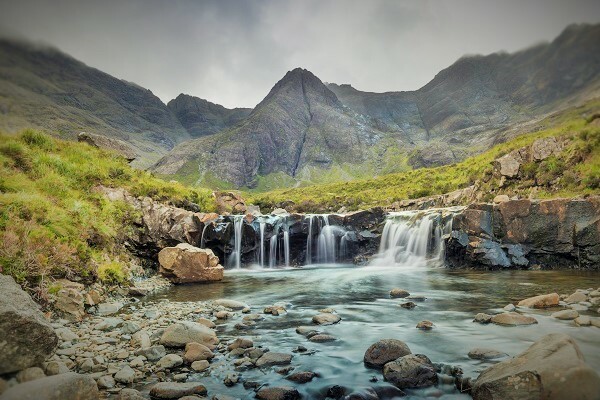 Dedicate day four to exploring the breath-taking natural beauty of this peaceful island; from the quaint port town of Portree, tour the north of the island and the Trotternish Peninsula with its natural features such as “Kilt Rock” and “the Old Man of Storr” or visit the famous Fairy Pools. Wildlife is in abundance, in the coastal waters you can spot seabirds, dolphins and seals. 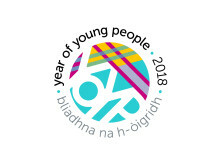 Possible cultural visits include Dunvegan Castle, home of the Macleod Clan, the Museum of Island Life and nearby Flora Macdonald's Grave or the distillery of famed malt whisky Talisker. 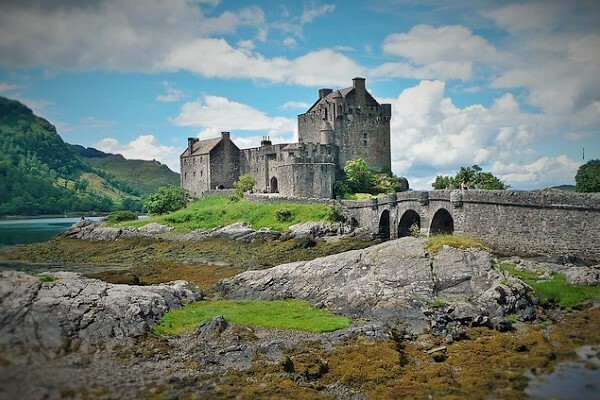 This morning, cross back to the mainland via Skye Bridge and visit one of Scotland’s icons at Eilean Donan Castle spectacularly set at the meeting point of three lochs. Then cross the wilderness of Scotlands Highlands heading for the shores of Loch Ness; a brief detour north along the windswept banks of the eerie Loch Ness will offer views of Urqihart Castle. 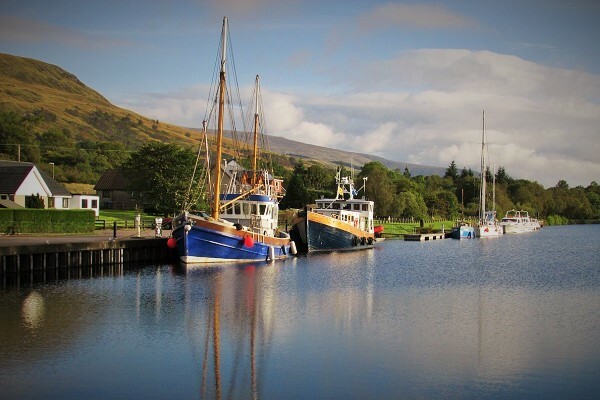 Then return south to the lively port town of Fort William on the shores of Loch Linhe; here you may choose to hike in the foothills of Ben Nevis, Britain's highest peak, or visit the Ben Nevis Distillery. 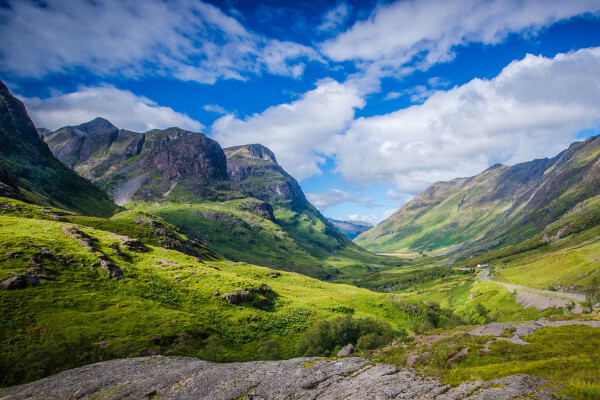 A final day of Highland scenery awaits as you pass south through the spectacular Glencoe Valley, over the desolate Rannoch Moor and through Trossachs National Park. You may choose to stop on the "Bonny Banks" of Loch Lomond, before arriving in Glasgow, Scotland’s largest city. In contrast to the Highlands Soak up the urban Scottish vibe as you explore the Victorian monuments George Square, Glasgow Cathedral and Necropolis or the renowned Kelvingrove Park and Museum in Glasgow’s leafy West End. Enjoy a final breakfast in your hotel before checking out. You may have a chance for some last-minute souvenir shopping or sightseeing (luggage can be stored at your hotel) before making your way back to Glasgow Airport (or transferring to Edinburgh) to check-in for your return flight to your home nation. 7 nights accommodation (suggested accommodations listed below). 7 days car rental inclusive of all mandatory taxes, insurances and charges. 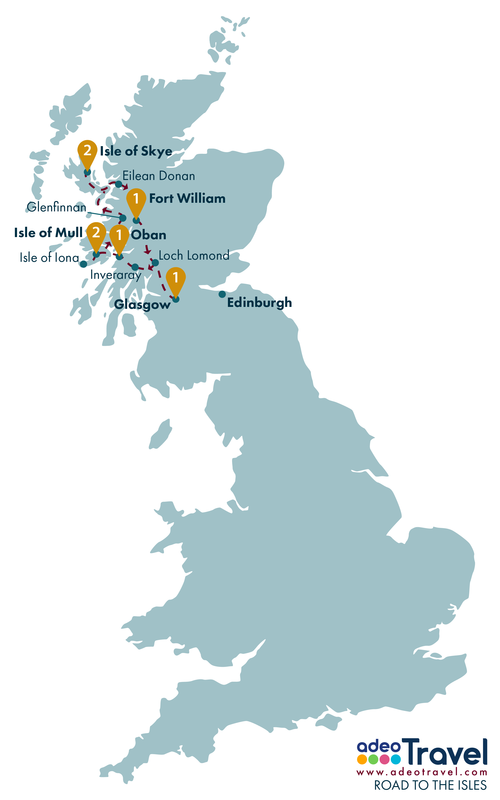 Add an extra night on Mull or Skye to explore these islands further. Add extra nights to expore Inverness, capital of the Highlands or Edinburgh City. Stay in quaint family run B&Bs throughout your tour or on selected nights. 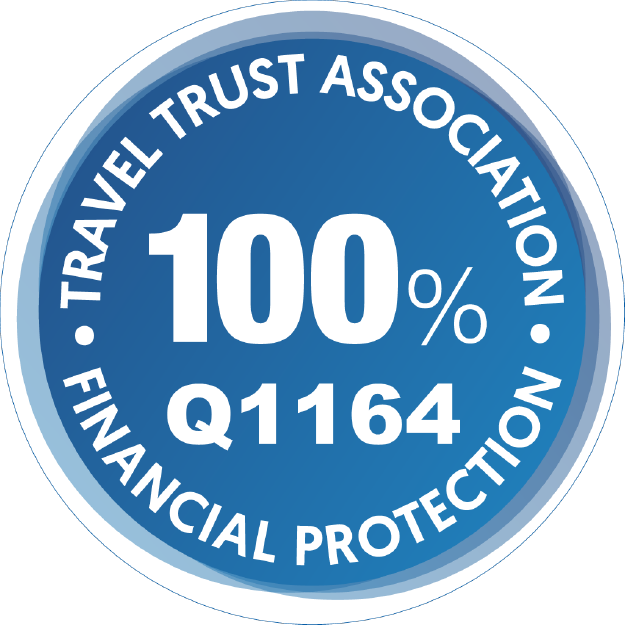 From GBP £795 per person (based on two people travelling).